Did you know that 80% of your sales are made by only 20% of your customers? Furthermore, only 20% of your employees are doing 80% of the valuable work, and of the 80% of your time spent, only 20% of is actually productive. Where did the rest of your time, work, and customers go? Why only 20%? It was wasted, and you don’t need to waste it. Just over a century ago, Italian economist Vilfredo Pareto observed that 80% of the land in Italy was owned by only 20% of the citizens, and that meant that only 20% of the people held 80% of the wealth. 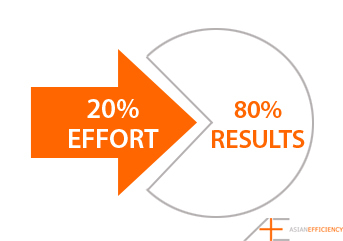 Also called the Pareto Principle, the 80/20 rule doesn’t just apply to Italian landowners – it’s been proven to apply to businesses and even everyday life. If you’re doing well now, imagine how much better you could be by honing your 20% and ridding yourself of the extra waste. If you’re not doing so well, imagine how you could turn that around. How can you determine where your 20% lies, and how can you hone it for any business? 1. Get Data Analytics on Your Side The 80/20 law is all about numbers, so it makes sense that you’d need numbers to put it into action. Most modern businesses work almost exclusively online, and if they don’t, they at least have an online presence. What your website or social media presence is gifting you is trackable insights. Take advantage of Google Analytics or softwares and dig into the heart of your website, so you can find your 20%. Which articles gain the most traffic? Which products are clicked on most often but not bought? Which advertisements gain the most leads? These results are telling you what your 20% is. Now you can see the style of content and products your customers are really interested in, and gain even further insights into who your ideal audience really is. Sure, a decent portion of your audience is middle aged women – but is it the younger women who comprise your 20% most active? Focus on them. 2. Find the 20% Within Your 20% As mathematicians dug into the heart of the 80/20 concept, they found something that’s valuable to businesses; within your ideal 20% is another 20%. If you have twenty customers who buy the most from you, then there will be four of them who buy everything from you. If twenty of them are young women, then four of them will be young women at a certain age or from a certain region. Keep this in mind as you dig through your analytics, and see who these magic 20% within 20% are. Make them the focus of your business, drawing in more of their kind and boosting your success exponentially. 3. Know That Activity Doesn’t Mean Productivity If you see someone who works eight hours a day, does overtime, and still communicates with employees, colleagues, and clients when they’re at home in their off time, you’ll imagine them as a highly successful and productive person. But the exact opposite is true. If you need sixteen hours a day to accomplish what you need, then you haven’t found your 20%. It’s not about how busy you are, it’s about what’s actually being accomplished – and if your 20% is being accomplished above all. When you find there just aren’t enough hours in the day, look at what you can refine from your schedule. Would adding something to your FAQ prevent reoccurring customer calls? Those extra hours spent replying to emails in the morning could be better spent working on a project, or collaborating with a partner, or closing a deal – the things that make a real difference. 4. The Hierarchy of Business Exists For a Reason – Don’t Forgo It When your business was just starting up, you had your fingers in every pie; nothing went out without first coming to your desk. But as a business grows and more employees are taken on, a hierarchy is formed and no hierarchy works if the ruler is constantly coming down to help in the stables. You may love customer service and value it as the most important part of your business, but when you spend your time taking calls, you’re not spending time closing deals, making the right connections, making plans for forecasted trends, or scheduling a project for the right time. It’s tempting, because you want to make it perfect and you may even be able to do a better job than the person you hired. But it’s impossible to be everywhere at once, and hiring the employee was for the good of your 80/20 ratio – don’t invalidate it by taking a step backwards. Do your job, and let them do theirs. 5. Outsource the Little Things - Get the Right People on the Right Jobs Outsourcing is a perfect way for you to keep your 80/20 ratio balanced – but only if you do it right. You may think that outsourcing your IT department or marketing team is an excellent way to free up your time for other projects or to put it in more capable hands; you’re saving time, aren’t you? On the contrary, the most vital and difficult portions of your business are the very portions you need to be involved in. No one will see the same vision or make the same choices as you, and even if they do, it will take a lot of time and a lot of failure to train them to this point. In the meantime, you’ll have falls in productivity and you’ll spend more of your time trying to manage them rather than accomplishing work, shooting your 80/20 in the foot. Instead, save the outsourcing for things that are less important, and are either too easy to mess up or won’t have significant results if they don’t turn out just as you planned. Decide what the main pillars of your business are, and give the rest to other hands.